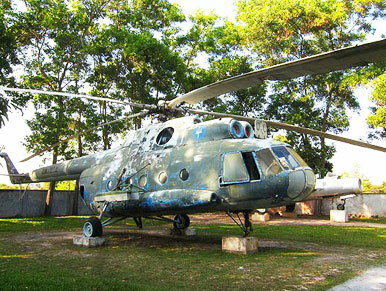 The War museum in Siem Reap, Cambodia displays numbers of old military equipment, such as aircraft, tanks, landminesand and guns, all in quite shabby condition. 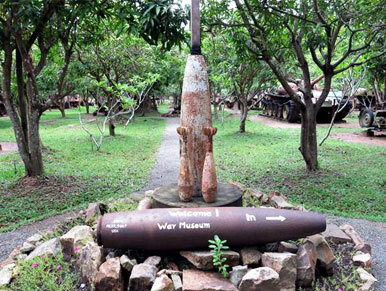 The Siem Reap War Museum is located on National Route No 6 near the Cambodian Cultural Village. Coming from Siem Reap town on the right hand side, just behind the military office. Take a Remok, Motorbike or car. The guy that runs this small and very new place was forced to join the Khmer Rouge as a boy and trained to make as lay landmines, something they were all too good at. The Vietnamese-installed government rescued him in 1985-so his story goes-and thereafter he helped the government in clearing areas where landmines have been laid. His name is Akira and he is a friendly guy that speaks English and Japanese ad is happy to visit with people that come by. He has a lot of the weaponry on hand that has been used over these past few decades, during Cambodia?s civil war and the long struggle against the Khmer Rouge that followed. It?s worth a look. Admission is free, but donations are appreciated. To get there, go past the Hotel Grande de Angkor (on the road to the Angkor ticket checkpoint) about 1 km to a small sign on the right for the Civil War Museum. Turn right, and follow this road to a four-way intersection and turn left. There is a sign for the place here. Go about 1 km and you will see it on the right. 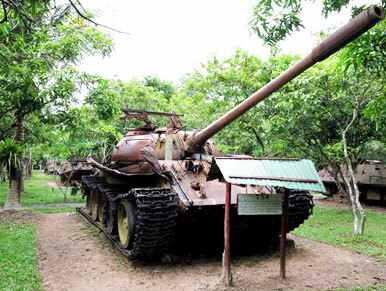 Civil War Museum, Siem Reap is one of the popular tourist attractions in Siem Reap. Whenever you come to Siem Reap, visit this sightseeing spot to get a better insight into the history of the region. The Civil War Museum, Siem Reap is run by a guy who was forced to join the Khmer Rouge as a boy and trained to make as lay landmines, something they were all too good at. After the Vietnamese-installed government rescued him in the year 1985, he helped the government in clearing areas where landmines have been laid. The name of this boy is Akira and he is a friendly guy. He speaks English and Japanese and feels very happy to meet the people who come to visit this place. The guy who runs the Civil War Museum, Siem Reap has a lot of the weaponry on hand that have been used over these past few decades, during Cambodia?s civil war and the long struggle against the Khmer Rouge that followed. The collection in this Civil War Museum in Siem Reap is definitely worth a look for one and all who are intrigued by the turbulent past of this place. The admission to the Civil War Museum, Siem Reap is free, but donations are appreciated. If you want to get to the museum then go past the Hotel Grande de Angkor on the road to the Angkor ticket checkpoint about 1 kilometer to a small sign on the right for the Civil War Museum. Then turn right, and follow this road to a four-way intersection and turn left. You will find a sign for the place here. Drive for more 1 kilometer and you will reach the Civil War Museum.